Singapore is known as the Southeast Asia’s snack powerhouse and is credited for popularising salted egg chips, fish skin chips and mala chips. 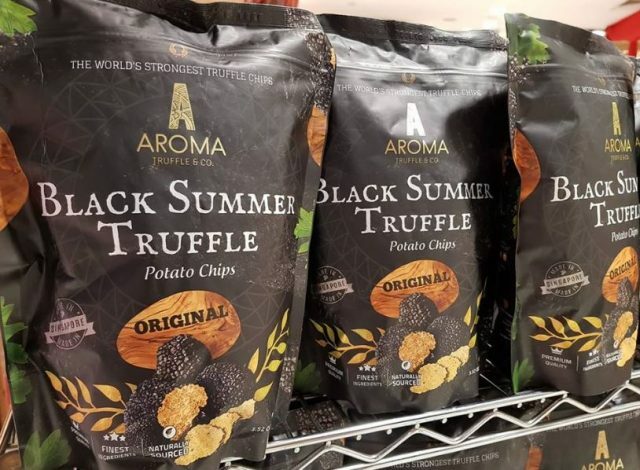 The latest innovation, the truffle potato chips, first made available around September 2018, represents an ambitious attempt by a Singaporean snack company to tackle a premium Western ingredient. Available in two flavours Original and Parmesan Cheese, the truffle chips are the first truffle chips from Singapore. They are available online (SGD 10) and at Cold Storage (SGD 9.95). Potato, Olive Oil, Sugar, Parsley, Maltodextrin, Salt, Himalayan Salt, Edible Oil, Vegetable Powder, Dextrose, Carob Powder, Italian Black Truffle, and Flavorings.